Elections in the Kurdistan Region, Turkey, and Iraq grabbed international headlines for 2018. It was a time for reestablishing relations for the Kurdistan Regional Government with capitals following the internationally opposed independence referendum, Kirkuk events, and international flight ban in late-2017. With political tensions high, protests rocked sweltering Basra through the summer. It was also a time for Kurdish mathematician Caucher Birkar to be awarded the Fields Medal and Yezidi activist Nadia Murad to be awarded the Nobel Peace Prize. Iraq and the Kurdistan Region continue to form their new governments under the watchful eyes of Iran and the West. The former head of the largest pro-Kurdish party in Turkey defiantly led a presidential campaign and helped to increase the number of HDP politicians in the Turkish parliament. In Syria, the predominately Kurdish Syrian Democratic Forces (SDF) continued to progress areas once controlled by ISIS in eastern Syria; however, their main force, the Peoples’ Protection Units (YPG), lost control of the northwest canton of Afrin after an assault by the Turkish military and their proxy fighters went unchecked by Russia and the US-led coalition. Iran reopened the two remaining land gates with the Kurdistan Region of Iraq in January which Tehran had closed for more than two months after Kurdistan’s vote for independence. Turkey despite mobilizing troops never closed its only official land crossing with the Kurdistan Region at Ibrahim Khalil in Duhok. Despite Turkish President Recep Tayyip Erdogan's bombastic rhetoric about closing off Kurdish oil exports through his country, Ankara did not implement any serious measures against Erbil after the referendum. Following an incursion by Iraqi forces supported by Iran-backed Shiite paramilitias and militias into all the disputed areas, tensions between Erbil and Baghdad gradually were reduced after KRG Prime Minister Nechirvan Barzani met with then Iraqi PM several times in Baghdad and in Europe. The KRG also paid visits to regional countries including Iran and Turkey, while reestablishing international ties to European, Russian, and other Western leaders. The Kurdistan Regional Government received a 12.67 percent share of the Iraqi federal budget in 2018. Oil exports by the KRG which had been halted following the Kirkuk events resumed in November under Baghdad's watch. In Turkey's Operation Olive Branch it utilized overwhelming firepower and conscripts in a two-month battle to seize the Kurdish canton of Rojava in northwestern Syria. 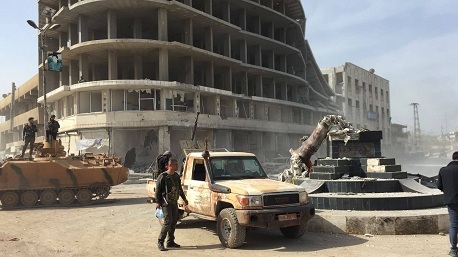 The primarily Kurdish Peoples' Protection Units (YPG) were not supported by the United States or Russia despite the group's contributions to the anti-ISIS coalition. Afrin fell on March 24. The Kurdish forces have vowed to fight an insurgency against what they believe is an occupying force. Damascus also condemned the move as an aggression of Syria's sovereignty. International organizations reported forced displacement. Baghdad ordered the closure of all international airports in the Kurdistan Region on September 29, 2017. Kurds saw this as overly heavy payback for holding their independence referendum. There was hope that flights would continue at the start of the new year, but Iraqi Prime Minister Haider al-Abadi extended the ban for another three months. It wasn't until Iraq's interior ministry sent technical teams to Erbil in March when actual progress was made. A joint committee with the KRG's interior ministry was formed to administer all international points of entry. Things returned to relative normalcy for passengers at Erbil International Airport in March. However, Turkey has refused to open its airspace to flights bound to or for Sulaymaniyah International Airport. Ankara claims a PKK presence in the province makes flying conditions unsafe. Iraq held its first post-ISIS parliamentary election on May 12. The race was perceived as a tug-of-war between incumbent PM Haider al-Abadi, who was perceived to be closer to Western interests, and various other Shiite politicians who had links to Iran. Abadi and former PM Nouri al-Maliki — both Dawa Party members — ran on split tickets. Muqtada al-Sadr formed an unlikely alliance with the Communist Party and won 54 of 329 seats. The results of the election were disputed, in particular by smaller parties in the Kurdistan Region which alleged voter fraud, however a partial manual recount and their approval by the Federal Court in Baghdad and the former president left the results largely unchanged. In the Kurdistan Region , the Kurdistan Democratic Party increased its seat count to 25. The PUK regained its stature as the second-largest in Kurdistan with 21. Gorran picked up a mere 5 seats. Upstart New Generation took 4 seats, while Barham Salih's Coalition for Democracy and Justice managed just 2. Salih would later leave CDJ and rejoin PUK to become Iraq's third Kurdish president — a move criticized by many of his followers. KDP took the seat of the second deputy in parliament with Bashar al-Haddad. Sunni politician Mohammed al-Halbousi, the former governor of Anbar, became speaker. After months of delays and political dealings, Adil Abdul-Mahdi won the majority in parliament to be elected as prime minister. Turkey in April announced snap presidential parliamentary elections to be held on June 24. The move was seen as politically expedient for President Recep Tayyip Erdogan. The year before Turkey passed constitutional reforms via referendum to change the country from a parliamentary to a presidential system following the election. Selahattin Demirtas has been jailed since November 2017 on various charges including supporting the banned PKK. Demirtas denied the charges and led a spirited campaign for the pro-Kurdish HDP from behind prison bars often tweeting through his lawyer. The international community criticized fair media coverage for the candidates. Despite the difficulties, the HDP won 65 seats — six more than in the previous election and more importantly won 10 percent of the overall vote to secure their seats in parliament. Erdogan won 52.59 percent of the votes, while the CHP's candidate took 30.64. Pope Francis announced in May that Louis Raphael I Sako, the Chaldean Catholic Patriarch of Babylon, would be among 14 clergy to be elevated to cardinal. The new cardinals came from regions where Christians are a small minority like Japan, Pakistan and Iraq. At the consistory at Saint Peter's Basilica in the Vatican on June 28, Sako chose to forgo wearing the traditional red robes, instead wearing black as is customary in the Chaldean Church. Sako was born in 1948 in Zakho, a city in northwest Iraq, which is now a part of the Kurdistan Region. "A patriarch also has a red habit just like the cardinals. And our Chaldean church is a martyrs' church through the whole history. Even now we are giving martyrs. And I do hope that the blood of the martyrs will be fertile, will bring us a new situation," he said, vowing to use the new position to help improve relations between Iraq's Christian and Muslim communities. Protests began in Basra in early July and quickly spread to other southern cities including Najaf and eventually northward to the capital of Baghdad. The demonstrators demanded better services, job opportunities, and less governmental corruption. They occurred while Iraq was in a highly politicized state — post election while winners were scrambling to form alliances and agreements for posts in government. Basra is one of Iraq's most oil-rich provinces. Provincial officials claimed the federal government was not fairly distributing revenues back to the province. The Iranian consulate in Basra was torched in early September and then a new building constructed. Western countries denied any involvement. The US consulate in Basra withdrew non-essential staff following the unrest. Sporadic protests followed through the remainder of the year with some calling for steps towards autonomy. Marivan native Caucher Birkar, 40, was endeared in the hearts of the Kurdish nation when he received the Fields Medal in Brazil for his work in mathematics. The University of Cambridge professor became the first Kurd to be bestowed what is considered by many to be the highest award in the field for those no older than age 40. "I'm hoping that this news will put a smile on the faces of those 40 million people," Birkar said. He was congratulated by all major Kurdish parties and billboards were erected in his home village of Nie in Rojhelat, or Iranian Kurdistan. Three Iranian missiles struck party headquarters in Koya belonging to the Kurdish opposition parties on September 8, causing massive material damages and killing 17 people in the Kurdistan Region. The Iranian Revolutionary Guard Corps confirmed it fired six ground-to-ground missiles. They hit PDKI and KDP-I facilities injuring 46 including civilians and refugees. Mohammed Qadir Zada, a member of the PDKI leadership, succumbed to his injuries. Western powers, including the United States, condemned the attack, but did not respond militarily. The events were widely seen as an Iranian show of force. The Kurdistan Region held its first parliamentary election since 2013 on September 30 with the PUK regaining its position as the second-largest party and the KDP increasing its seat-count. Voter turnout was 58 percent — down from 75 percent in 2005 and 74 percent in 2009. Opposition parties like Gorran and the Kurdistan Islamic Union cried foul after their poor election performances. The KDP won 45 of the 111 seats in the election. The PUK won 21, Gorran 12, upstart New Generation 8, Komal 7, an Islamic Reform list 5, and a leftist Modern coalition one. The KRG continues to work to form a new cabinet with some MP-elects choosing not to be sworn into parliament. Yezidi Nadia Murad received the Nobel Peace Prize in Stockholm after four years of sharing her and other survivors' stories of ISIS atrocities. “I share this award with all Yezidis, Iraqis, Kurds, other persecuted minorities and all of the countless victims of sexual violence around the world," Murad said in a statement. She and renowned gynecologist Denis Mukwege were bestowed the award for their efforts to end the use of sexual violence as a weapon of war and armed conflict. Newly engaged to Abid Shamden, Murad was welcomed to Baghdad, Erbil, her homeland of Shingal and the Vatican. The biggest story for the world was Trump becoming president. He is greatest strongest president america ever saw and he fears nothing. Kurds should not betray Trump and America. Let us all make america great again. The world has betrayed the Kurds. Russia and America have allowed Turkey to slaughter the Kurds of Afrin and replace them with Turkish and Arab jihadists, America has allowed Iranian backed Arabs to kill Kurds in Kerkuk and elsewhere and occupy their ancestral lands. The Talabani family was instrumental in selling out Kerkuk to the Arabs. Treason is treason, the Talabanies are traitors. It was bad year, indeed. But there is still Kurdish progress despite all treasons. May the new year become the year of the Kurdish independence and of great Kurdish achievements.